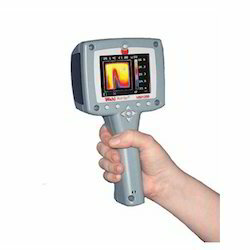 Prominent & Leading Service Provider from New Delhi, we offer hand held thermal imager. We are engaged in offering a wide range of Hand-Held Thermal Imager. These products are manufactured using premium quality raw material, obtained from authentic vendors of the industry. In addition to this, we make these products available to the customers in varied specifications, in order to meet their exact requirements. Furthermore, we make sure to examine the quality of the entire range before delivering these products to the clients end. Just scan the target area and find the hottest spot on the screen. Place the hottest spot of your target on the center of the screen indicated by the circle (shown in picture below). It will also indicate the temperature of that spot. Then, simply press the laser button, and the laser will point to the hot spot on your target, corresponding to where it appears on the center of the screen. You can then take a thermal picture and store it in the Pocket PC. Components which have failed or are fatigued such as fuses, circuit breakers, transformers, etc. All these features and critical applications makes Hot Spot finder The Lowest Cost, High Performance, Thermal Imaging Camera in the Market! Looking for PDM Instrument ?